My recent work is concerned with themes involving the making of meaning in art and personal identity. 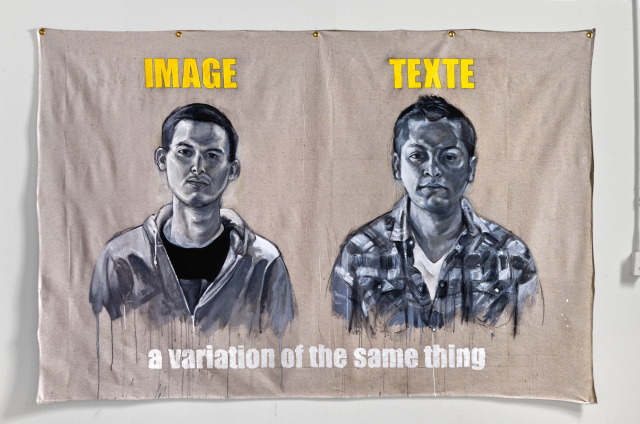 Several paintings make use of language and the connections/ disconnections made between the visual image and the written phrase. Also present are connotations of cultural identities that may or may not be tied to the culture as a whole, at least in terms of western art, and are made manifest through the presentation of the self. Beyond the visual image, language (and in particular language in translation) is symbolic of our difference and commonality as peoples; but more importantly it is a method of encoding and decoding. The presence of a phrase in another language, indecipherable to the viewer, represents an obvious literal and privileged meaning that is functionally unknowable, while still being obtainable; a process that may reflect the anxiety of the viewer when they are presented with a work of art. Of course art is contextual, and there may be meaning beyond the visual. How we make that meaning in connecting image, language, text, and subtext, filtered through our own experience and culture; and how we relate not just to art, but each other, is what concerns me right now as an artist.